"Kallakis (left) with Evelyne Genta, Prince Albert, Jabu and Taib's brother-in-law Robert Geneid, the owner/manager of the resort." PA likes to hang out with financial fraudsters. Kallakis was sued and I think he spent some time in jail for financial fraud. (Some english or scottish banks). And the Taib family is famous for destroying the rainforest in Malaysia. 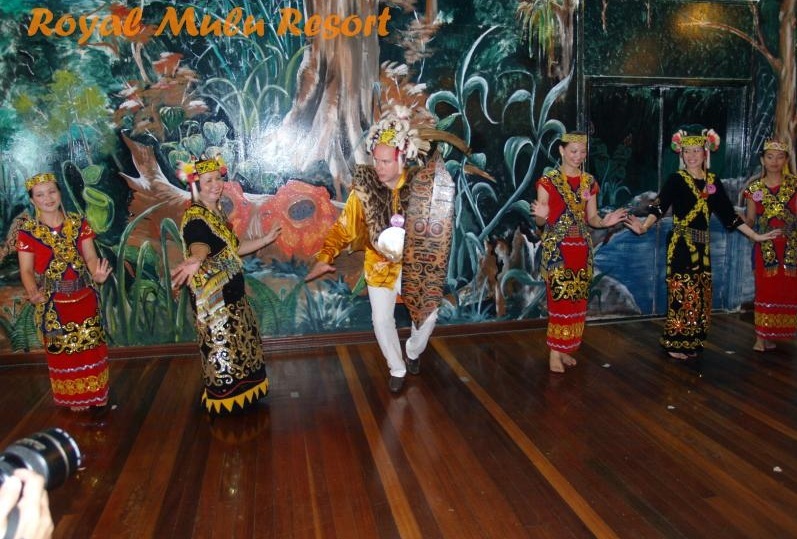 And here is PA "performing" at the Royal Mulu Resort. "Prince Albert is the fellow in the middle - why are the ladies laughing?" "Lapse of judgement? 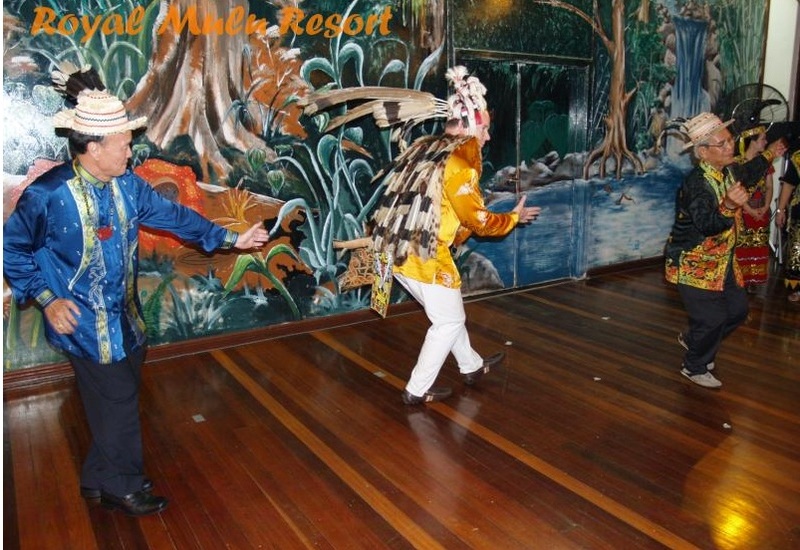 Albert and Jabu ape the indigenous tribal dances." The more pictures I see of PA and the people that are with him, the more I believe that most people around PA are financial fraudsters, tricksters, swindlers and PA´s presence provides them with respectability. I wonder whether that is PA´s intention. Stahl came up in an other thread and was to be discussed here. Surprisingly little is known about her, she's not advertising herself on Facebook (which I would expect) or something and wasn't mentioned on Wiki last time I looked. Some Monaco advisors have a short bio on the gouvernmental site, but not Stahl. 1 August 2008: member of the board of the prince Pierre de Monaco foundation (art. literature). Members are appointed for 3 years. Previously worked for a large French company. Worked for the Lebanese PM Rafic Hariri until he was murdered. Then worked for French president Jacques Chirac until he was replaced by Sarko and then started work for Albert. Was briefly promoted to private advisor during the Allevena business. Allegedly this affair was caused by a power struggle and a hissy fit of Stahl who didn't get along with Allevena and vice versa. A second person was fired too. Forgot the details and the name, it was a long time ago. Maybe it was the first seed of argument and irritation that cw seems to spread all around her? I have recently read about Stahl, the article mentioned the company she had worked for but for the life of me I can't remember where. Very annoying. And of course she is the writer of an extremely unobjective book about her boss with a modified second edition to include cw and a not further specified second book coming out soon. Please note that without further specification this might sound a lot better than it is. Every civil servant can say he worked for the French president. It doesn't have to mean she had an important position. Same goes for Hariri. I'm not really sure if Monaco is a promotion or a delegation with regard to the French president. It has the name of being cozy, easy, but one might wonder why she is where she is and not in some high flying job somewhere else. Thanks! None of those titles regarding Albert anyway make her look good, I am sure many people are wondering who the hell is actually advising this guy and in charge of his PR. The book thing really seals how incompetent they are there--who writes a book about their boss they are currently working for and on the payroll to! ;D How does Albert think he looks having his staff write a book to promote himself, not just one, but more are coming to promote the silly girlfriend too . Poor Monaco. I'm curious what exactly did her job entail for Chirac? Maybe the fact the last guy she did PR for was murdered, should have put up some red flags for Albert. .
At the mayor's office in Paris from 1989 until 1994 when Chirac happened to be mayor there (not president!). communications management positions within leading companies Française des Jeux from 1994 to 1998 (a company that organizes lotteries, lotto, euromillions, gambling kind of things). Hariri from 1999 until 2004. Hariri resigned in 2004 and was murdered in 2005. And is the only one I know who goes to a gala wearing pants! Repeatedly! Thanks Grimnir. I wonder what her performance was like working for the companies. It doesn't really matter because she is really screwing up the job that she is doping for Albert. Perhaps she is only managing their PR instead of advising and is Albert and Charlene who decided that this latest round of interviews was a good idea. Nope, it really doesn't matter because if I had a client that wouldn't take my advice, to same my integrity and reputation, I would quit. ^ Stahl isn't really working as Albert's private advisor. He doesn't have that many private/personal ones. She did that for a while, during the Allevena business and I suspect that that had something to do with it. But she is now back to advising Albert's cabinet, i.e. his ministers and advisors. And probably Albert too, since it is his cabinet in the first place... She hangs around him too much for it not to be so I suppose. Does anyone dare to come up with conspiracy theories about Allevena and the other guy leaving, Stahl doing a stint as Albert's personal advisor and cw's more prominent and permanent position after this? And about why Stahl was removed from the cabinet advisor post? What was threatening her there that was not threatening her as Albert's personal advisor? Why couldn't she stay where she was seeing that she went back to the same job 5 months later? Was that the time she wrote the book? Nobody but Albert can sack her, so what was the point? "Hariri from 1999 until 2004. Hariri resigned in 2004 and was murdered in 2005." What makes me wonder: If she was good in her job ... why Najib Mikati did not want to have her around? If her job was PR - no reason to let her go (working level) unless mistrust. If she worked as an adivsor ... she must been not good - or not good enough considering Hariri's career (who first dismisses and was murdered a year after that). Thanks for all the info everyone!!! I found the name of the other guy who was fired: It was Armand Deüs - in charge for media/ PR. The article says that there was a power struggle of over a year between Allavena + Deüs ... and Stahl. I remember to have read at TRF back then that Allavena was said to have refused to care for Charlene who was furious after Alberts rendevue with other girl (the yacht girl) while Albert was busy elsewhere. My guess: Allavena and Deüs saw it comming ... Stahl installing CW and all the tragedy we see today ... and tried to prevent it. Now Stahl is in charge of communication and public relations and totally screwed it!!! Exactly, because it's your name and reputation on the line! I've just been told that Albert had a very long phone call from Lacoste few hours ago. What about? Getting the anullment started? If I post here something about a very long phone call, it's not an usual one. Good to see you posting Lilae! Keep the news coming!